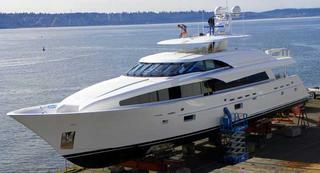 Northcoast Yachts is set to launch the company's latest project today. The 125-foot raised pilot house motor yacht is the largest vessel to be launched by the company since it was purchased by Stephen Yadvish in 2003. Exterior styling and interior arrangement were done by Northcoast’s chief designer, Paul Fredrickson. The interior design and décor were done by Yadvish and his wife JoDee.